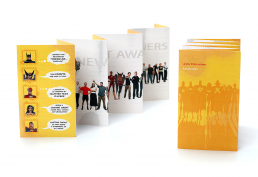 I created posters, booklets and a pocket phone book for Landor Associates’ 2004 T&T Awards – an in-house rewards initiative which recognizes employees’ achievements. 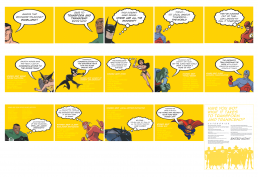 For the Landor New York office, a Justice League theme was chosen as a way to make the imagery lively, positive, and fun. I created miniaturized Daily Planets to be placed on all of the employees’ desks the night before the awards were announced. I also designed sixteen, large format posters to be positioned throughout the office. 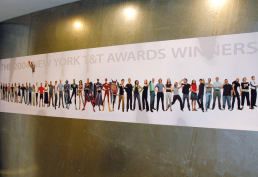 In addition, a giant horizontal banner was created which featured individual “hero” shots of each of the New York office’s employees. I then juxtaposed the poster’s composition to be used as the background for a clever, wallet-sized office phone book with additional Justice League imagery on the front cover. My designs generated excitement about the awards and helped to build a greater sense of company-wide collaboration and appreciation.